The first Squier Silver Series Strats did not have a 'Silver Series' identifier on the headstock. This Sonic Blue colour, prone to turning slightly greenish due to yellowing in the top coats, was common in the first Silver Series batches. Later adverts however, didn't mention this colour. Black, white, sunburst and (Torino shade) red were the only listed options by 1993. I seem to recall, however, that in the latter phase of production, Salmon Pink Hank Marvin bodies began to appear on regular Silver Series Strats. The left hand version of the guitar was advertised in sunburst and black only. This is all UK-specific. Fender had produced Squier Stratocasters exclusively in Japan between 1982 and 1987. But in the mid ‘eighties, they were forced by the massive success of much cheaper, Korean-made guitars (the Marlin range, for example), to rethink. On the UK market, the cheap, cheerful and well-featured Marlin Sidewinder had been hammering the Squier Strat’s sales, ending up topping the bestsellers chart for nearly two solid years. Had Fender not resolved to compete with the new Korean-built instruments on level terms, they could very well have been stifled out of the budget market, from the bottom up. Hence, the decision was made to contract out production of a new wave of Squier guitars for manufacture in South Korea. So starting in ’87, a new Squier Stratocaster appeared. With unprecedented low prices, the MIK (Made in Korea) Squier was exactly what Fender needed to hit back at the Korean-made brands now dominating so much of the budget sector. I only have access to UK-focused info, but here in England, the Korean Squier Strat almost immediately became the nation’s best selling guitar, finally subordinating the Marlin Sidewinder in the market. Essentially, Fender did continue producing their standard model of Squier Strat in Japan, but it was promoted to full Fender status to avoid an impossible battle for sales against the massively cheaper Korean-made Squiers. This meant that by 1988, no Squier-branded quitars were coming out of Japan. If you wanted a new Squier Strat, it would be made in Korea, out of plywood. For a while, it was one long party for Fender as the MIK Squier Strat relentlessly topped the sales charts, month after month. But as the 1990s got underway, a number of new commercial dangers for Fender began to make themselves apparent. Fundamentally, some Korean manufacturers were not content with making rockbottom budget instruments only. They wanted to produce higher budget guitars, and trade on quality and value, rather than purely price. In order to take sales away from the likes of Fender whilst promoting the superiority of their own product, Korean manufacturers (Young Chang in particular), homed in on the Squier’s plywood construction, and used it as a negative marketing ploy in their ads. If young guitarists weren’t previously thinking “avoid plywood guitars!”, some of them certainly were now. It made a lot of sense for Fender to start shipping Japanese Squiers again at this point. Not only would it help confuse and potentially turn around the decline in Squier’s brand image, it would also remove what was essentially a rebranded MIJ Squier Strat from the base end of the Fender price range. One less guitar to dilute sales of higher priced Fenders. Critically, with that brand-interchangeable ‘standard’ MIJ Strat finally back under the heading of Squier, Fender could, if necessary, cut corners on its spec and maintain the price point without damaging the reputation of the Fender brand. The new Japanese Squier would accordingly make it very difficult for any Korean Strat copyist to climb the price ladder. The first Squier Strats to come into the UK from Japan in the 1990s were the Hank Marvin models – maple neck and Salmon Pink finish only. 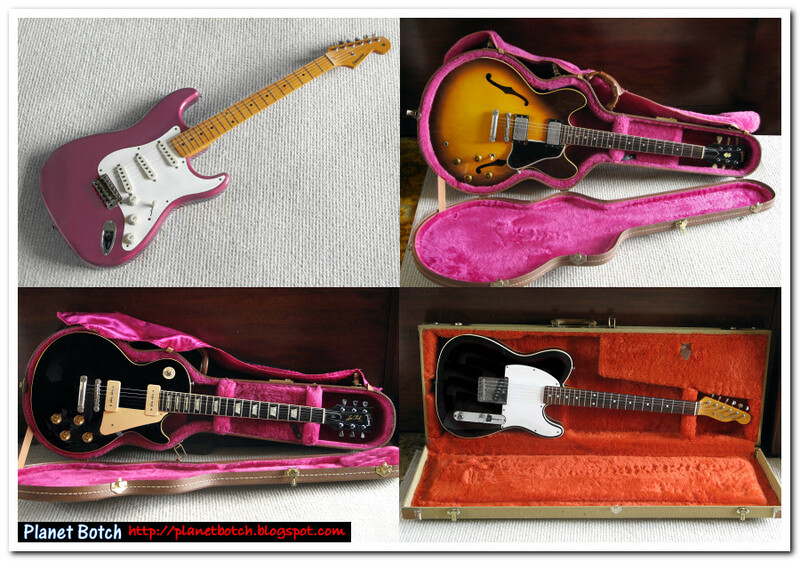 All of these had Hank Marvin’s signature on the headstock, and had solid wood bodies. I first became aware of them near the beginning of 1992, but the first of them probably came in very late in '91. Incidentally, you can see a rare depiction of Hank endorsing a Korean Squier Strat in my Hank Marvin Strat Precursor piece. Immediately after the arrival of the Marvins, the Squier Silver Series Stratocasters hit the scene. They were very similar to the Hank Marvins – same solid bodies, same hardware, same electrics, same truss rod arrangement, etc. But they weren’t confined to one colour, and they came with a choice of either a maple neck or a rosewood fretboard. The Silver Series body wood was, incidentally, officially alder, but The Guitar Magazine (Xmas 1993 edition) suggested that in some cases other woods may be be substituted. Whilst the Squier Hank Marvin Strats always had a single-ply white scratchplate, the Silver Series Strats could have either three-ply white/black/white, three-ply black/white/black, single-ply white, or single-ply black. I’ve seen rosewood board and maple neck Silver Series Strats with three-ply plates, and maple neck with single-ply, but I haven't seen a rosewood board version with a single-ply. I think initially it was three-ply for rosewood, and single-ply for maple, in keeping with vintage reissue tradition. Both the Hank Marvin model and the Silver Series Strats were introduced with a UK RRP of £275, but the first dealer ads I saw for them, which would have been submitted for publication in January '92, priced the guitars at £249. The first Silver Series Strats imported into the UK did not have a ‘Silver Series’ logo on the headstock. They had a mid to late ‘80s style Squier Japan Stratocaster logo, with ‘Squier’ in silver ‘transition’ script. The headstock markings were pretty much the same as the ones on the Hank Marvin, but minus the signature. The ‘Made in Japan’ denotation was located beneath the word ‘Stratocaster’. The serial numbers of these first Silver Series Strats may not correspond with the year 1992 (and indeed the very earliest examples may not even be 1992 guitars - they were possibly shipped in December '91). Due to the fact that some of the serial numbers correspond with the year 1990, a notion has arisen that there was such a thing as a 1990 Squier MIJ Strat. This is not the case (not that I know of, anyway). Such guitars will be from the initial Silver Series batches. Because there was no way to tell that the first of these new Japanese Squiers were meant to be Silver Series guitars, some shops advertised them in the first month as Squier Standard Strats (Japan). But other outlets did bill them as Silver Series, and the Silver Series name definitely appeared well before the headstock logos were added. It’s important to recognise, though, that not all Japanese Strats with silver ‘transition’-style Squier logos are Silver Series. An assessment needs to be made based on the exact features and the presence of an early ‘90s serial number. I'll detail the main features shortly. Very soon, the Silver Series markings were added. To give some idea of the timeframe, the Squier Silver Series guitars were reviewed in the July 1992 edition of Guitarist. Guitarist reviewed a Strat and a Tele. Their Tele did have the Silver Series logo on the headstock; their Strat didn’t. That mag would have hit the shops between 10th and 15th June ’92, so by around the middle of spring, some Silver Series guitars evidently did have the Silver Series headstock identifiers; others still didn't. The bodies of the first Silver Series Strats were very similar to those on the MIJ Vintage Reissues. They had individual cavities for each pickup, and no extra wood relief under the scratchplate, beyond the standard routings a vintage Strat would have. However, the bodies were definitely not identical to those on the Japanese ’57 or ’62 Strat Reissues. The ’92 Japanese Squier bodies were definitely produced entirely separately from those on the Japanese Fender reissues. In some respects the Squier bodies were actually better. They normally had superior shaping to the ’57 and ’62 Japanese Fender bodies, with smoother and rounder edges, but since the Japanese Reissues were quite unpredictable around this time, that wasn’t always the case. I suspect Fender Japan were using a higher grade of wood for their vintage reissues, but that doesn't always, by default, translate to better tone. I replaced an early '90s Fender Japan '62 reissue body with a Squier Hank Marvin body, and liked the sound of the Marvin body better. The machineheads on the ’92 Silver Series Strats were Gotohs, of very good quality. Vibrato bridges were of the vintage type – typical Squier with no branding on the saddles, unlike the Japanese ‘57/’62 reissue bridges, whose saddles were double Fender stamped. The electrics were cheap, but not necessarily that nasty. The pickups were ceramics with bar magnets across their bases, but they had quite a thick sound for a slim single coil, which suited some guitarists. Other guitarists may describe the tone as a bit 'boxy' for a Strat. The five-way switch was the usual enclosed YM50, and the pots were cheapo minis. The mini-sized pots are a good way to tell these guitars from the late '80s Japanese Squiers, all of which had full-sized pots, to the best of my knowledge. Things didn’t look very confidence-inspiring under the scratchplate, and it obviously wasn’t gonna make you sound like Hendrix, but this was a guitar which, after discounting, would be selling brand new somewhere around the £235 mark once all the shops were well stocked. The necks were really nice and the bodies were solid. For that sort of price, you couldn’t expect much more. The big external difference between a Silver Series Strat and a Squier 'Standard' Strat from the mid to late 1980s was that the Silver Series had its truss rod adjustment on the headstock face, and not at the body end of the neck like an '80s 'Standard'. So if you're looking at a 'vintage' design MIJ Squier Strat with three single coil pickups, 21 frets and a vintage type vibrato bridge, and it has the silver 'transition' style logo, then if it also has a hole above the nut for truss adjustment, it was made from 1991 onward. If it has no truss rod access on the headstock it was made between the end of 1984 and 1987. But remember, that only applies to Made in Japan Squiers - and only the 'Standard', roughly vintage design models. 1987 MIK 'Standards', for example, have the truss rod access on the headstock, as do some MIJ Contemporary Strat designs from the '80s. The Squier Silver Series Strats were well received, and they remained available until around the spring of 1995 in the UK shops (they were officially replaced by the poplar-bodied, Mexican Fender 'Squier Series' Strats around the end of 1994). Discounted prices stayed relatively static throughout most of the guitars' three-year tenure (approx £235, rising to £245-ish), which is better than could be said for some Japanese Fender models. Some of the vintage reissues rose in price quite significantly over the same period. Note, however, that the MIJ Squier Wayne's World Strat, which is considered by some to be close enough to Silver Series Strat's spec to share its status, was given an RRP of just £189 at the end of 1992, and some discounters did also reduce the regular Silver Series Strats as low as £199 around that period. Whilst the Squier Silver Series was not anymore desirable than the previous run of basic (vaguely vintage styled) Japanese Squiers of the mid to late ‘80s, and was in terms of spec slightly inferior, it was a much needed weapon for Fender in the early ‘90s. I’m convinced that the Silver Series Squier Strats did cause serious headaches for the Korean manufacturers seeking to move up to mid-priced territory. They disabled the soundbyte: “Squier is now plywood, and therefore it’s rubbish”, and that, once again, made Squier a very difficult brand to market against. By mid '94, I doubt the Silver Series was making Fender much money, so its demise was fairly inevitable. But it staved off a lot of competition, and today, a nicely kept Squier Silver Series Strat certainly represents the brand in a good light. ?????... How Much Is Your Guitar Worth?